There are a number of psychological themes which are key to really understanding education: for example, the internal processes of learners, the nature of learning in culture and the influences on teaching and learning. Written specifically for education studies students, Psychology and Education is an accessible text that offers a clear introduction to educational psychology on education studies programmes. It considers the key psychological ideas that will support students' understanding of how different individuals and groups of individuals learn and behave in educational contexts and settings. Looking at factors that influence learning and attainment, the book discusses themes such as the relationship between cognition and emotion, emotional intelligence and motivation. Throughout, the emphasis is on encouraging the reader to avoid stereotyping, attributions and rigid views of learner ability. 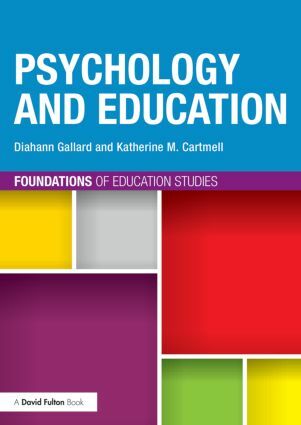 Part of the Foundations of Education Studies series, this timely textbook is essential reading for students coming to the study of educational psychology for the first time. It will ensure that undergraduate students are confident and competent with core psychological ideas related to education and help them to understand how different individuals learn and behave in educational contexts and settings. Diahann Gallard is a senior lecturer at Liverpool John Moores University, UK. Katherine M. Cartmell is a senior lecturer at Liverpool John Moores University, UK.